Sen. Richard Blumenthal at a press conference in Hartford Monday before traveling to Washington for the abortion bill vote. Updated at 7:10 p.m. with Senate vote. Washington – Connecticut’s Democratic senators on Monday helped block a bill in the Senate that would have outlawed abortions after 20 weeks of pregnancy. The Senate’s vote on the “Pain-Capable Unborn Child Protection Act” was 51-46, but the GOP needed 60 votes to overcome a Democratic filibuster of the bill. 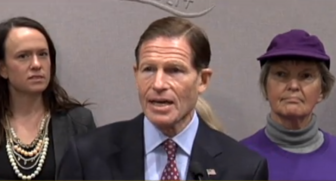 Earlier Monday at a press conference in Hartford, Sen. Richard Blumenthal condemned Senate Majority Leader Mitch McConnell’s decision to put the bill to a Senate vote. The measure to restrict abortion has been approved in the U.S. House several times. Instead of wasting valuable floor time with extreme, ideological bills to strip rights away from people, Republicans should be working with Democrats to negotiate a budget and keep our government running. Have they already forgotten their deadline is next week?” Murphy said. GOP Senate leaders knew the bill had a slim chance of approval in the Senate, where Republicans have only a 51-49 majority. But they hoped to put some vulnerable Democrats running for re-election in red states this year on the record on abortion, especially Sens. Claire McCaskill of Missouri and Heidi Heitkamp of North Dakota. Both women voted against the bill, as did Sens. Sue Collins, R-Maine, and Lisa Murkowski, R-Alaska, both of whom were the sole defectors from their party. But several Democrats from “red” states voted for the bill. They were Sens. Joe Manchin or West Virginia, Joe Donnelly of Indiana and Bob Casey of Pennsylvania. Susan Yolen, vice president of public policy for Planned Parenthood of Southern New England, called the “Pain-Capable Unborn Child Protection Act” a new assault on reproductive rights. “If the results are bad…very often abortion needs to be at least a consideration in that woman’s mind and that of her partner,” Yolen said. But antiabortion groups argued that 20-week fetuses respond to a series of stimuli. “Scientists believe that that’s the point that unborn children feel pain,” said Peter Wolfgang, executive director of the Family Institute of Connecticut. Connecticut bans abortion after “fetal viability,” which is considered later than 20 weeks but is determined solely by a physician. But 24 states impose abortion prohibitions after a certain number of weeks of pregnancy. Seventeen states impose a ban 20 weeks after fertilization or its equivalent of 22 weeks after the woman’s last menstrual period on the grounds that the fetus can feel pain at that point in gestation.